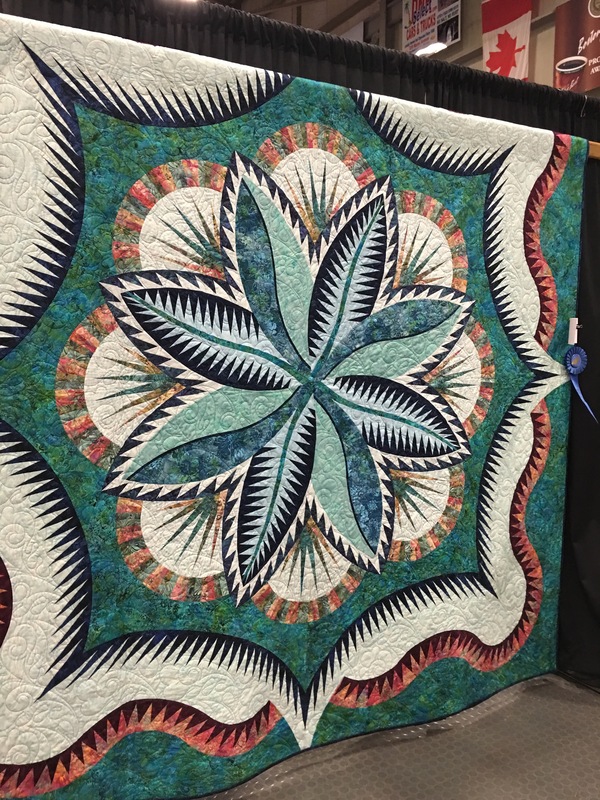 I have always wanted to visit the Pine Tree Quilter’s Annual quilt show but it rarely works out with our vacation schedule. This year we got lucky and the timing worked out. 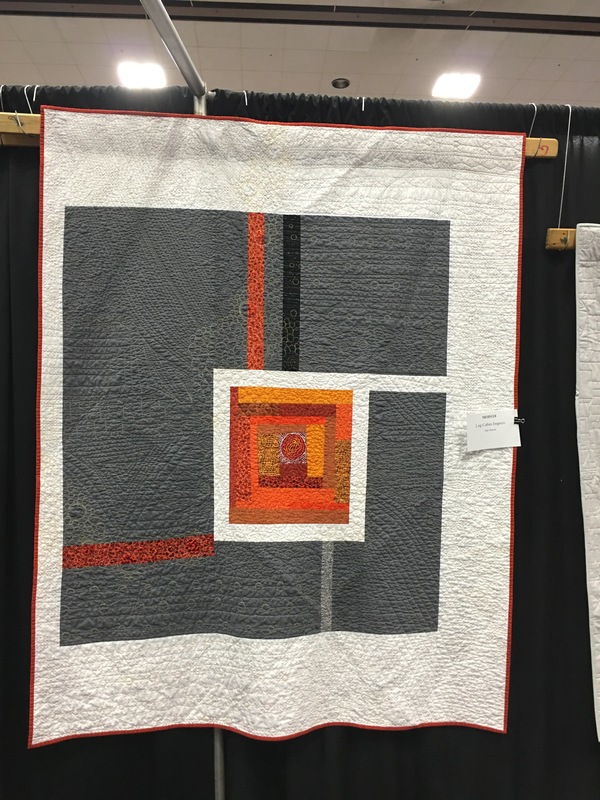 It is a very nice show with a good variety of quilting styles and construction methods. 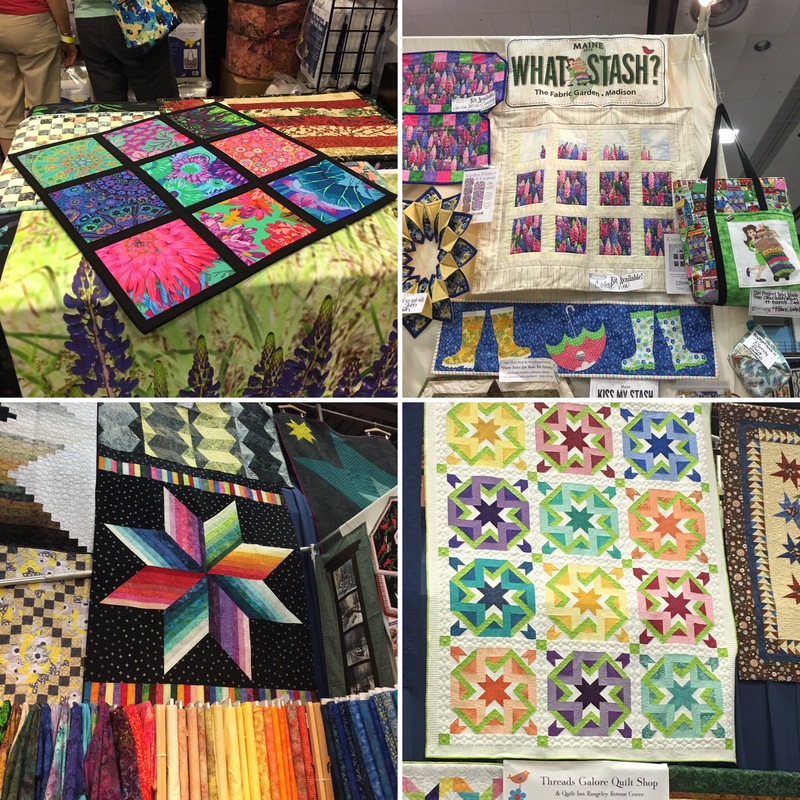 They boast over 600 quilts and more than 50 vendors. I didn’t get to take any classes, but the line-up looked interesting. 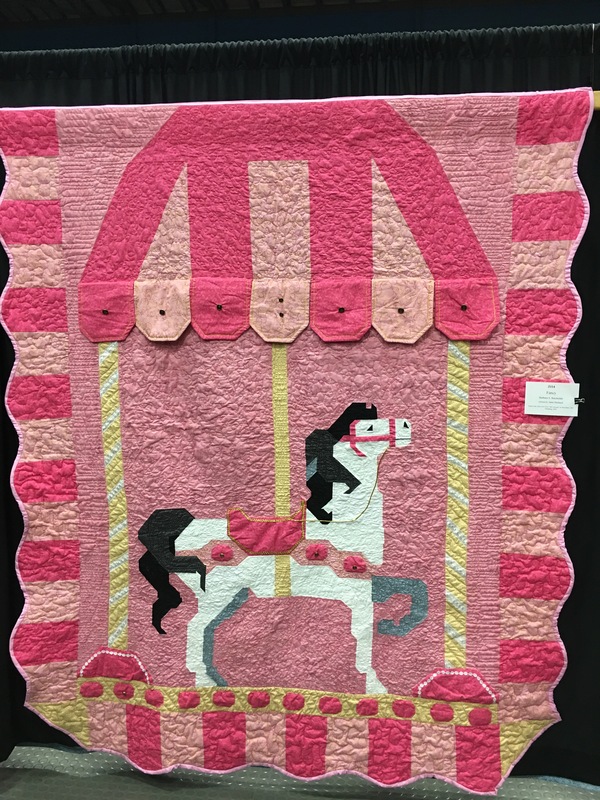 This quilt is called “Over the Meadow,” and was made by Barbara Binnotto. 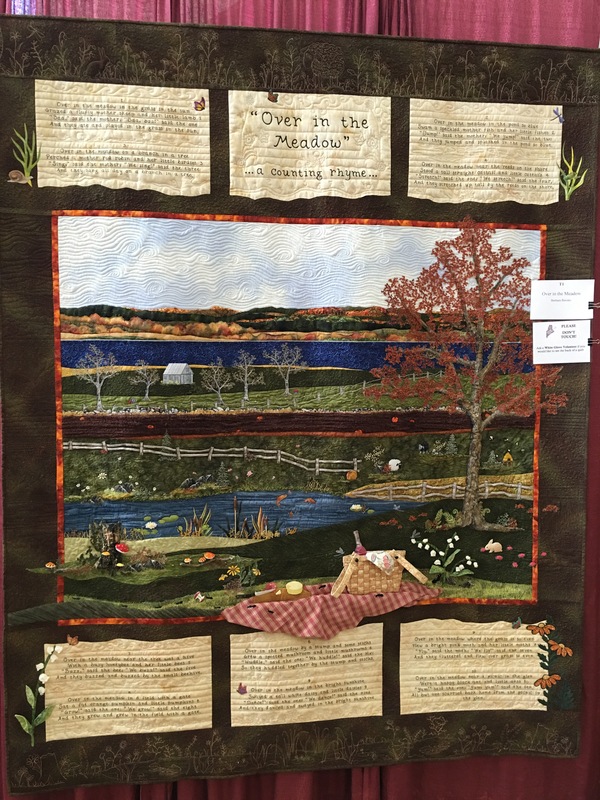 The scene is beautiful and the sentiment lively, but what i really loved about this quilt is her dimensional additions to bring the story of the quilt to life. The detail on this quilt is charming. 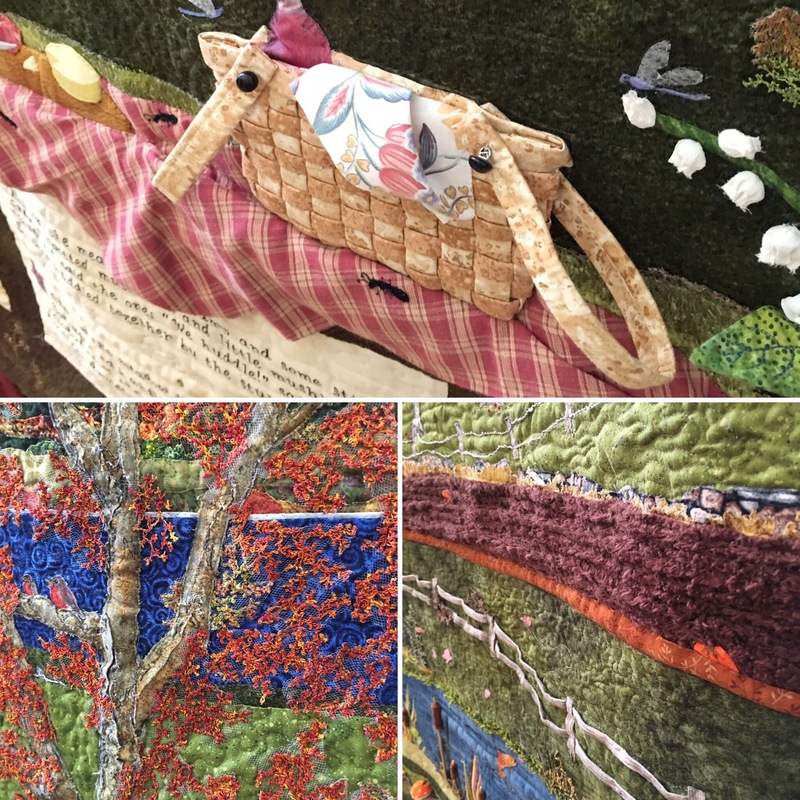 The leaves pop off the quilt, you can imagine the tablecloth fluttering in the wknd, and the chenille (or whatever it is) really brings the dirt to life. Nice job! Two quilts caught my eye for their charm for a child. “Fancy,” by Barbara A. Batchelder would make any young girl giddy with joy. 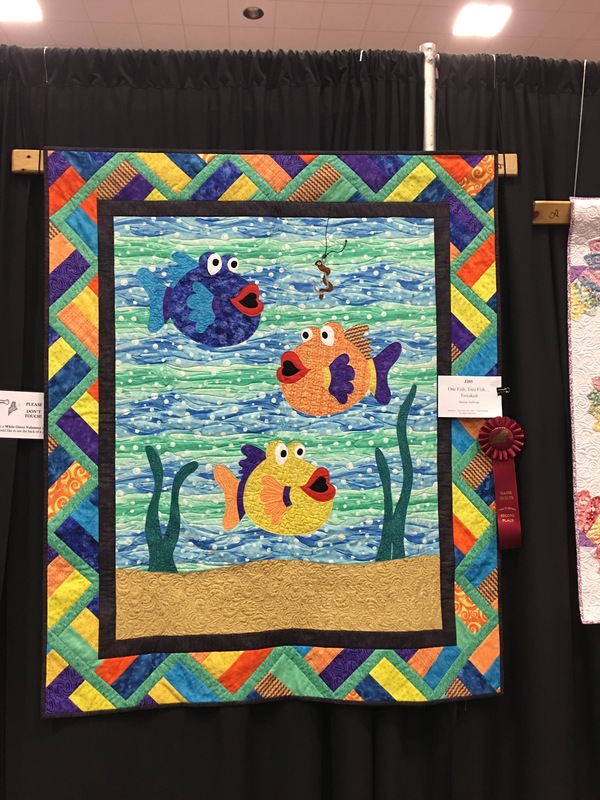 “One Fish, Two Fish… Tweaked,” by Denise Sullivan also made me smile. Beyond the sweetness of her fish, I loved the colorful border. It elevates the entire quilt for me. This quilt is stunning in its detail, color composition and precision. “Fire Island Hosta Queen,” by Ginette Ouellette is a true work of art. There were more tradition quilts than modern, but this modern submission is beautiful. Quite logically named, “Log Cabin Improv,” I loved everything about it. Sue Duval did a great job, especially with the quilting. There was a lot to see in the vendor mall as well, and it was especially nice to see my friends from Threads Galore, an awesome shop in Ramgeley. I love one of their sample quilts (bottom right) and see that pattern in my future. It was fun to see the show and talk to locals. Now on to Rangeley!